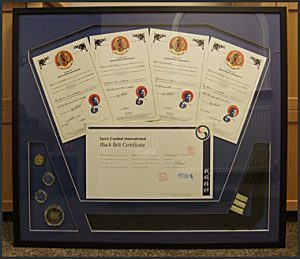 First up, a bunch of certificates and medals awarded for spirit combat, displayed along with a 3rd dan black-belt in a deep rebate simple black frame with a unique designed hand-cut mount. 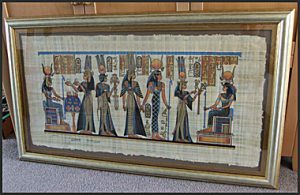 Next, a large Egyptian papyrus float mounted onto complementary coloured mount board and framed in antique gold effect polymer moulded frame with antique gold leaf glass spacer. 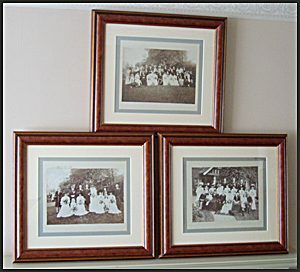 These are flat… 3 vintage photographs conservation mounted framed in walnut effect frames to complement the pieces. 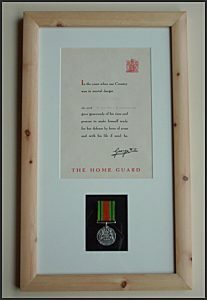 And finally, a 2nd world war Home Guard certificate and defence medal, framed in natural pine.